Is it or is it not true that when the hired Assassins are deploy and the mainstream media picks up the story and runs with it. Over and over again, we hear about the story, all types of evidence seen and unseen, heard and unheard. Details on the very activities of everyone involved in the new BREAKING STORY. Everyone bites and regurgitates the sound bites verbatim and the hype continues until some one completely exposes it as a False Flags. It is very evident that within the False Flag scenario that people “die” in fact, their deaths keep the story alive and well. If you believe that surveillance is at its height, then how did this little caravan of smuggled, black market oil get over looked. I still have a question, after they blow up all of these oil refineries and tankers and trucks, what is left for Syria to use to take care of their own people who have not escaped to other countries? I wonder if Russia will help in the rebuilding of the infrastructure they are destroying? Now obviously, conclusive evidence that Ankara is knowingly facilitating the sale of ISIS crude will probably be hard to come by, at least in the short-term, but the silly thing about Erdogan’s pronouncement is that we’re talking about a man who was willing to plunge his country into civil war over a few lost seats in Parliament. The idea that he would ever “step down” is patently absurd. Unfortunately for Ankara, The Kremlin is on a mission to blow this story wide open now that Turkey has apparently decided it’s ok to shoot down Russian fighter jets. On Wednesday, we get the latest from Russia, where the Defense Ministry has just finished a briefing on the Islamic State oil trade. Not to put too fine a point on it, but Turkey may be in trouble. That’s the Cliff’s Notes version and the full statement from Deputy Minister of Defence Anatoly Antonov is below. Let us be the first to tell you, Antonov did not hold back. “Today, we are presenting only some of the facts that confirm that a whole team of bandits and Turkish elites stealing oil from their neighbors is operating in the region,” Antonov continues, setting up a lengthy presentation in which the MoD shows photos of oil trucks, videos of airstrikes and maps detailing the trafficking of stolen oil. The clip is presented here with an English voice-over. Enjoy. 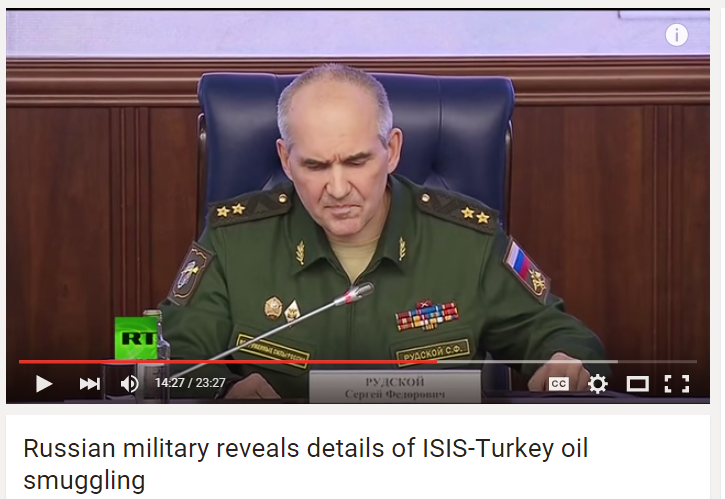 Oh, and for good measure, Lieutenant-General Sergey Rudskoy says the US is not bombing ISIS oil trucks. International terrorism – is the main threat of our time. This threat is not illusory but real, and many countries, primarily Russia, knows this firsthand. The notorious “Is Islamic state” – the absolute leader of the terrorist international. This is a rearing monster of international terrorism can be countered. And you can win. Over the past two months, Aerospace Russian forces is clearly demonstrated. We are firmly convinced that victory over LIH need to deliver a powerful and devastating blow to the sources of its funding, as repeatedly mentioned by President Vladimir Putin. Terrorism has no money – is a beast without teeth. 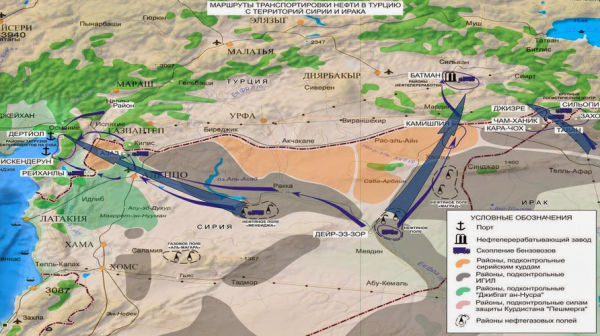 Oil revenues are a major source of terrorist activity in Syria. They earn about $ 2 billion. Dollars annually, spending this money on hiring fighters around the world, providing them with weapons, equipment and weapons. That’s why so LIH protects thieves oil infrastructure in Syria and Iraq. 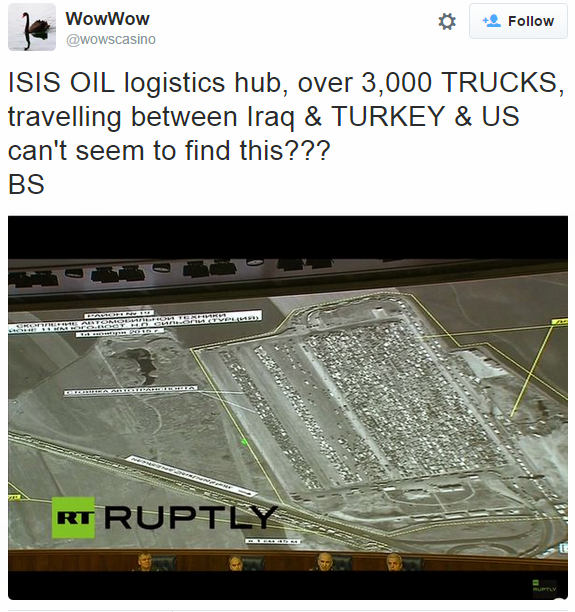 The main consumer of stolen from legitimate owners – Syria and Iraq – the oil is Turkey. According to the data entered in this criminal business involved the highest political leadership of the country – President Erdogan and his family. We have repeatedly talked about the dangers of flirting with terrorists. It’s like that stokes. The fire from one country can spill over to others. This situation we are seeing in the Middle East. Today, we present only part of the facts, confirming that the region has a team of bandits and Turkish elites stealing oil from the neighbors. This oil in large numbers on an industrial scale, for the living pipelines from thousands of oil tankers entering the territory of Turkey. We are absolutely convinced today present you the hard facts about what the final destination of the stolen oil – Turkey. There is a large number of media representatives, and Our briefing will see more of your colleagues. In this regard, I would like to say the following. We know and appreciate the work of journalists. We know that in the journalistic community, many courageous, fearless people honestly do its job.Today, we have clearly shown you how the illegal trade in oil, the result of which – the financing of terrorism. Provided concrete evidence that, in our opinion, may be the subject of investigative journalism. We are confident that the truth with your help will, will find its way. We know the price to Erdogan. He has already been caught in a lie again Turkish journalists who opened Turkey delivery of arms and ammunition to militants under the guise of humanitarian convoys. For this imprisoned journalists. Do not resign Turkish leaders, particularly Mr. Erdogan, and did not recognize, even if their faces will be smeared by oil thieves. I might be too harsh, but at the hands of the Turkish military killed our comrades. The cynicism of the Turkish leadership is unlimited. Look what they’re doing ?! Climbed to a foreign country, it shamelessly robbed. And if the owners interfere, then they have to be addressed. I stress that Erdogan’s resignation is not our goal. It is – it is the people of Turkey. Our goal and the goal to which we urge you, ladies and gentlemen, – joint action to block the sources of funding for terrorism. We will continue to provide evidence of robbery by Turkey of its neighbors. Maybe I’ll be too straightforward, but the control of these thieves in business can be entrusted only to the most close people. No one in the West, I wonder, does not cause the issue that the son of the President of Turkey is the leader of one of the largest energy companies, and son-in-appointed Minister of Energy? What a brilliant family business! This, in general, may elsewhere? Well, once again, of course, such cases can not be charging anyone, only the closest people. Votes this fact in the Western media we do not see much, but it sure can not hide the truth. Yes, of course, dirty petrodollars will work. I am sure that there are now discussions about the fact that everything you see here, – falsification. Well. If it did not – let be allowed in those places that we showed journalists.